In Pusan, Niwa plans an event to shoot random group photos with no purpose. In addition to this, the artist intends to join spontaneous commemorative photos of strangers such as tourists in the city and keep shooting commemorative photos with people he just met. These images are then presented on billboards around the city. 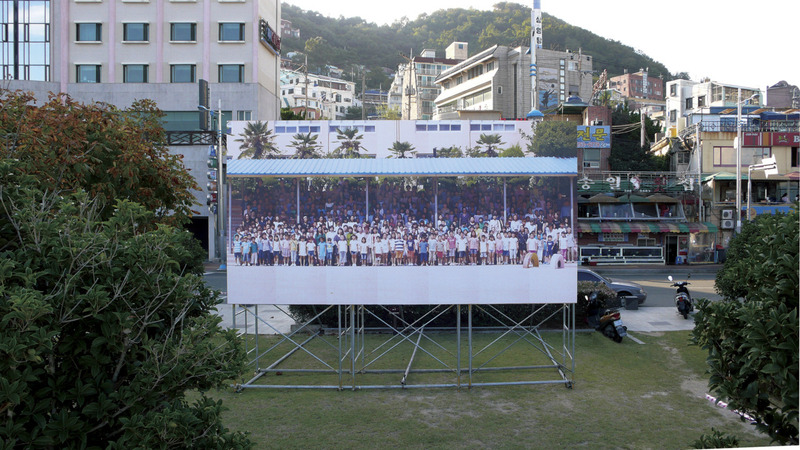 People take group photos as a commemorative monument of each community/collective. It is supposed to certainly function as a symbol of a very particular collective, however, in the approach of this project, the collective that is to be the subject is unspecified and hidden, making each participant to place different meanings upon it and disrupting the domain of the collective by purpose. In other words, the collective captured in each photo is performing a false appearance of “we just happened to be there” without a specific title for it, and that is the whole truth. Therefore, the intention of this photo shoot can also be said is to form the vessel itself of “we”, a vessel into which anything may be placed through photographic media. The relationship instigated within these group photos is wholly limited to that time and place and is an intangible relationship that will soon vanish, existing between people who will never meet again in their lives. In this project, what is focused upon is not photograph as a medium in building a momentary sentiment but as the very device by which to create a relationship with people even if it is intrusive, where a form of false appearance is born by intentionally displacing and manipulating the “action of taking photographs and people taking them”, and this itself is the core of the work. From the discomfort produced by the forced nature of these group photos, a question is formed as to the very meaning – what it indicates – of the familiar term “we” that we often use when facing the world. Also, by directly intervening in the simple social action of taking a commemorative photo, a search is undertaken towards the condition of our awareness of collectivity which lies behind such actions.